The HC-02 is a reusable humidification chamber for use with any compatible humidifier heater bases and is recommended for adult applications. 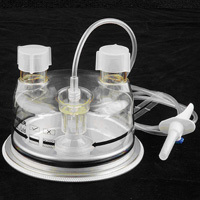 The chamber is used to provide humidification for intubated or non-intubated patients. Ensure that the chamber and circuit are connected well before use. Refer to the humidifier operating manual for recommended set-up on the humidifier. Replace and Sterile the chamber in accordance with hospital infection control procedures. DO NOT fill the chamber above the max. fill level line. Liquid could enter the breathing circuit if the chamber is overfilled. DO NOT fill the chamber with water in excess of 36°C. If a waterfeed set is used, ensure the water bag is placed below the level of the humidifier after the chamber has been filled. Ensure the humidifier as not tilted. Tilting the humidifier may result in water entering the breathing circuit. Do not touch the heater plate or chamber base. Do not exceed a maximum peak flow rate of 180L/min. AUTOCLAVE:136°(277°) @220Kpa(32Psi) for 4minutes or 120°C(248°F) @96Kpa(14.1Psi) for 15 minutes. Chemical Immersion: Solutions such as Medizyme Pyroneg, Control 3, Solution 2 Cidex have been tested according to the manufacturers directions. Other brand names with similar active ingredients may also be suitable.